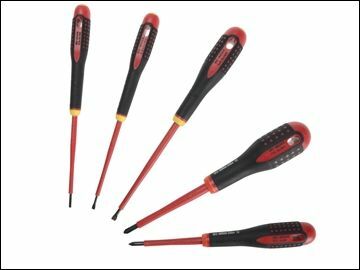 Bahco Insulated ERGO™ Screwdriver Set has been developed according to the scientific ERGO™ process, for work on live equipment, up to 1,000 Volts. The handle is made from a three component material that provides maximum user comfort and force transmission. Its easy to choose the right tip, with the colour-coded handle and the symbol on the domed end. The blade is made from high performance alloy steel, that is insulation moulded directly onto blade. The black finish tip provides higher accuracy. ISO 2380 / DIN 5264. Individually inspected and manufactured according to IEC 60900. 3 x Slotted: 3 x 100mm, 4 x 100mm & 5.5 x 125mm. 2 x Phillips: PH1 x 80mm & PH2 x 100mm.